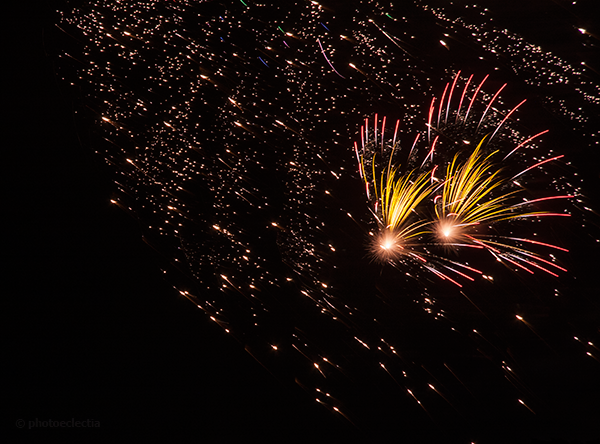 As a follow-on to Dancing with Light, here is a shot of the Philly fireworks that finally occurred (at 11 p.m.). Worth waiting for? Well, sure, but I think I prefer to stick to D.C. next time and the 9:15 start time! Fortunately, our hotel was just a stone’s throw away and we could wrap up our evening right after the fireworks ended, without a long commute to somewhere else. I was in Philadelphia over the 4th of July weekend, and, along with a whole lot of other people, headed for the area near the art museum to see the fireworks Thursday night. Thinking the fireworks would start around 9:15 or so, like they do in Washington, D.C., my husband and I claimed a patch of grass in a nearby park an hour earlier, and I set up my camera on its tripod. Well. The fireworks in Philly don’t begin until almost 11 p.m. A photographer is never bored unless equipment failure occurs. 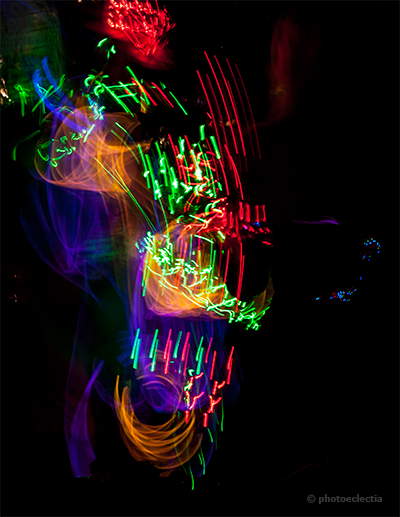 While my husband took a nap, I had fun photographing people playing with light wands. Here is a shot of a vendor demonstrating his wares.